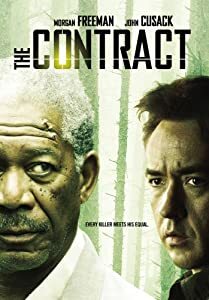 Two days ago, I watched the 2006 film, The Contract, starring Morgan Freeman and John Cusack. It took me two days to recover from this movie before I could write this review. To learn about the backstory, I’d strongly suggest you watch the trailer by clicking here. For those too lazy to do that, a very quick overview. Frank Carden (Morgan Freeman) is an assassin who escapes the U.S. marshals only to run into Ray Keene (John Cusack), an ex-policeman who is now a gym teacher (great career transition) and feels it’s his job to get Carden to justice. Keene and his son are pursued through the woods by Carden’s colleagues. This movie is certainly not one that I would have seen in theaters because the trailer doesn’t look that good. We got it for a few bucks and I wasn’t very entertained. Every time I see John Cusack or Keanu Reeves, I cringe, because I have no idea how they ever got into Hollywood. In everything I’ve seen them in, their acting has been horrible. Reeves starred in The Replacements with Gene Hackman, which I didn’t think was too bad, but that can be attributed to the supporting cast more than to Reeves. Nicolas Cage was great in Con Air, which overshadowed Cusack’s flat secondary role. Neither Reeves nor Cusack do anything for me. Now that you know a little about why I cringe, back to the review. Once again, Cusack was flat and boring. With Cusack as a main character, one could say this film was doomed before I started it. He’s supposed to be the father who has to balance his and his son’s safety against his want to serve justice, but his lack of emotion in displaying this predicament is a huge problem for me. I can’t relate to this character at all nor do I really care what happens to him. His son, played by Jamie Anderson, also has little emotional capacity. Maybe the characters are supposed to be introverts, but there are still ways that introverts show emotion and Cusack and Anderson fail to even do that. The same dialogue goes on again and again. Surprisingly, I got tired of hearing it (this sentence has been laced with deadly amounts of sarcasm). What is Freeman supposed to do with that? Similar to After Earth, there are more scenes of hiking/running then there are of actual action scenes. The action scenes were very unrealistic. Some great movies have very unrealistic action scenes, but that’s because the goal was to make the most improbable stuff happen because it’s cool and it gets people pumped. The scenes in this movie weren’t meant to be unrealistic, but somehow the filmmakers failed to make realistic action scenes and instead made them so corny that they were hilarious. The actors have serious faces on while doing these scenes, too, only adding to my amusement. 60-69 It’s got plenty wrong with it but I still got enjoyment out of this one. 40-49 This movie is just mediocre. It’s not doing anything other than the bare minimal, so morbidly boring that sometimes I’m actually angry I watched this. 30-39 Definitely worse than mediocre, the 30’s ironically define the 1930’s, full of depression, lack of accomplishments, poverty and just so dumb. 20-29 What did I just watch? Cliches, stupidity, nothingness, did I mention stupidity? Just…wow. My score for The Contract: 37. The humorous action scenes were the only thing that made me keep watching. I discuss these scenes more in-depth in the spoiler’s edition below, along with direct links to what I’m talking about. The acting was typical Cusack-ish, boring, dull, and corny as can be. This movie was also very predictable, which means there are no surprises. Unless, you’re really bored, I wouldn’t suggest watching this. First, the writers for this movie should feel horrible for ever conceiving the idea for this movie. Some of the worst writing I’ve ever seen. I’m pretty good at picking out good movies and I admit that I didn’t expect this to be good, but even an average performing movie will most likely get a score in the sixties. This is just a testament to how bad this movie really was. The movie starts with Keene’s son being busted for pot, and throughout the movie, Keene’s son is the stereotypical underachieving son. Later on, there’s a scene where one of Carden’s colleagues catches Keene between two trees and shoots him, walks over and says, “I hate amateurs.” As if on cue, Keene flips around, trips the guy and puts two in his chest. Keene gets up without a scratch. All of Carden’s colleagues are highly trained ex-military, so there’s simply no way that Keene didn’t get hit. It was stupid. Later on, Keene beats up two of them with right jabs. Here’s a clip if you want a laugh. There are plenty of other problems I have with this movie, but it’s seriously not even worth talking about. I’ve never even heard of this one. Good review. Have you seen The Factory with Cusack and Jennifer Carpenter? Not too shabby. Good ending. No I haven’t. Truth be told, I try to avoid Cusack at all costs. Couldn’t agree more, just watched this on a multi action movie purchase. Am completely surprised that Morgan Freeman even took this role. The amount of stupid that goes on is amazing. And when do you meet an ex cop without a gun? Just terrible writing. John Cusack is really one of those 80s 90s actors that just won’t go away. And then you play a role that involves your son, but you act like his death is secondary to arresting a guy you don’t even know what he did? Just stupid. It’s been a long time since I watched it and I don’t regret it that at all. The film is laughable in its execution, the dialogue’s stagnant and it all leads to audiences screaming at the television sooner or later. Thanks for reading and for the comment, kind sir.